ACE THEN AND NOW – a 180 page soft back book with over 300 illustrations. Forty years ago, swarms of motorcyclists roamed along London`s North Circular Road in nightly `burn ups`. They were the ton-up boys, coffee-bar cowboys….the Ace boys. This is their story, related by those who raced and the policemen who chased them, woven against a background of contemporary reports of escapades, accidents and deaths. “They were the good old days – the golden years”, recalls one of the boys. “If anyone asks me what they were like, I`d say, well, watch one of those Westerns like Dodge City when Wyatt Earp went and cleaned it up. That`s exactly like it was”. The Ace Cafe Then And Now opens with the start of bike racing in the London area – at High Beech in 1928 – and continues with the pre-war history of the North Circular as one of Britain`s new `arterial` roads and the establishment of the Ace at Stonebridge Park. Then, `Noddy` Cheese, one of the Ace`s original ton-up boys, paints a graphic picture of the excitement of life at the cafe in the 50`s and 60`s, his account being set against the cold facts of the increasing death toll amongst young motorcycle riders. The controversial Dixon of Dock Green TV episode is covered as is the making of the classic film The Leather Boys and the book goes on to descibe events leading up to the closure and subsequent isolation of the Ace with the construction of the new bypass in the 1990`s. The story is brought up to date with the resurrection of the cafe under Mark Wilsmore and the fantastic re-opening celebrations in September 2001. 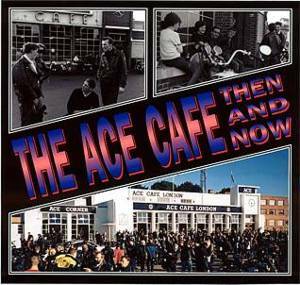 It`s all here….in THE ACE THEN AND NOW.